International Journal of Hindi Research is a Peer Reviewed Journal. Prime focus of the journal is to publish articles related to the Hindi studies. This journal provides platform with the aim of motivating students and personnel in Hindi Research. 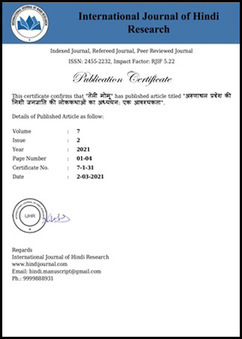 International Journal of Hindi Research considers review and research articles related to: Hindi Literature, Ancient Indian Sciences (In Hindi), Computation Linguistics, Culture, Epics, Grammar, History, Indian Aesthetics and Politics, Puranas, Religion, Sahitya, Veda, Vedic Studies, Buddhist Literature, Indian and Western Logical Systems, Indian Discourse Analysis, Indian Philosophy, Indian Socio-Political Thought, Indological Studies, Jain Literature, Hindu Astrology (Jyotiḥśāstra). Your views and comments will be highly acclaimed. Author can send their articles to hindi.manuscript@gmail.com. All manuscripts are subjected to RAPID peer review process and those of high quality (which are not previously published and are not under consideration for publication by another journal) would be published without any delay in subsequent issue. Online submission of the manuscript is strongly recommended. A manuscript number will be mailed to the corresponding author within one week or early. 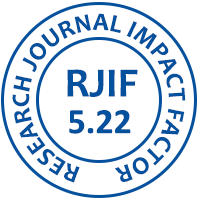 On the behalf of International Journal of Hindi Research, I would like to extend my regards to all fellow researchers and scholars and wish them prosperity in their field. 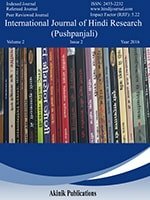 Hindi journal, hindi research journal.